I have never met a kid that doesn't like to do sand art and of course my girls are no exception. 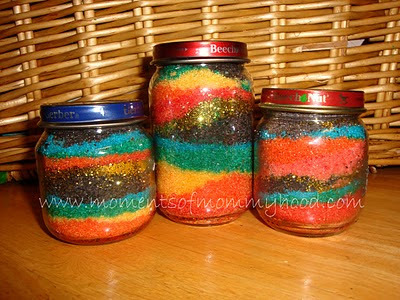 Today we made rainbow sand art only the "sand" is actually salt that we colored with some food coloring. and because it's been rumored that there is gold at the end of every rainbow, we added a layer of gold glitter.